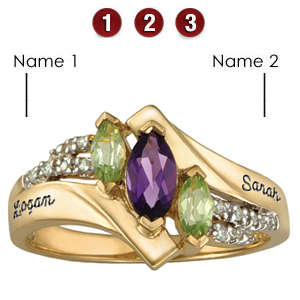 Select a birthstone color for three marquis shaped jewels. The center stone is 7x3.5mm; the two smaller marquise stones are 5x2.5mm. If a simulated stone selected, the marquise stones sit above 18 x 1mm round white topaz accent stones. If genuine stones are selected, they're paired with genuine white topaz accents. Engrave up to 10 characters in each of two engraving areas.